Scrambling through the dense forest undergrowth looking for signs from the past may not sound like your average archaeological expedition. 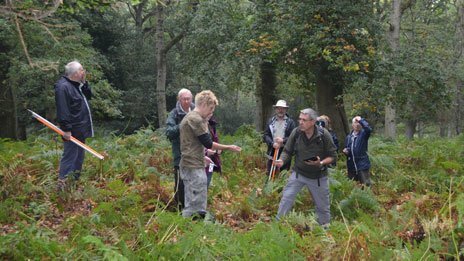 But a project in the New Forest National Park is discovering hundreds of new historical sites which have never been recorded before. 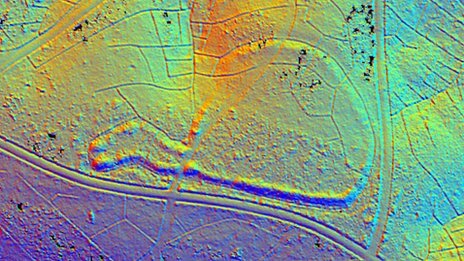 With the help of a technique known as Lidar - a laser beamed from a plane - a detailed 3D map of the terrain underneath the forest canopy has been created. It means that many stories of life in the New Forest, hidden away for decades or even centuries, are now being revealed. Roman pottery kilns, medieval field systems, Bronze Age burial mounds and Iron Age hill forts are just some of the 2,500 new discoveries. These are being added to the list of 1,000 known archaeological sites. But before an official record can be made, each find has be verified by a team of archaeologists and volunteers from the New Forest National Park Authority. Laurence Shaw, heritage mapping and data officer, says it is important to visit each feature to make sure it really is what it looks like on the map. "One feature we thought we saw looked like a Bronze Age burial site with several perfectly-shaped mounds. "We got to the first mound, looked underneath the vegetation and it's just a pile of wood. Went to the next one, again another pile of wood and the third the same. "Another site we got excited about looked like a mound but when we got there it turned out to be the most elaborate den built by children." However, most of the features do turn out to be genuine archaeological finds. "We have found an Iron Age hill fort not previously know about," he explains. "It was under complete tree cover." Mr Shaw's favourite site is a Bronze Age burial ground on Beaulieu Heath where two of the barrows were damaged in the 19th Century by a local rifle club as they built a target range. The laser mapping shed new light on what happened to them. It clearly shows how one mound was dug out and earth from another used make it higher. Documents from the time show this was done without permission and angered the verderers, Mr Shaw says. Lidar has mapped a 350 sq mile (900 sq km) area, including the entire national park and beyond. Using the 3D map, conventional maps and satellite images, we work our way through the trees and across a stream in the woods near Fritham. Another team heads off in the search of Roman pottery or anything else associated with the kiln industry which was booming in these parts nearly 2,000 years ago. Mr Shaw says there are also a number of Bronze Age burnt mounds in this area, often found with a trough inside where hot stones were put to heat water or cook food. "The density of these is probably the highest anywhere outside Ireland," he says. My team head off in another direction looking for a large inclosure, and we soon discover a bank which appears to form a perfect square. Steve Fisher, another archaeologist working on the project, says this is probably a post-medieval inclosure, used to keep animals in or out. A track running through the middle may however pre-date it and could have been created during the Roman era by people walking between and transporting goods from the pottery kilns. So far, about 35% of the 3,500 identified features have been checked. Over the next seven years, the team hope to have the whole area mapped and features added to Hampshire's Historic Environment Record. Some could become scheduled ancient monuments. "But they're very rare," Mr Fisher adds. "There are certain features we may recommend for this, but that's not really up to us to decide." The earliest sites appear to be Bronze Age, which began about 4,500 years ago, and anything up to and including World War II is being included. 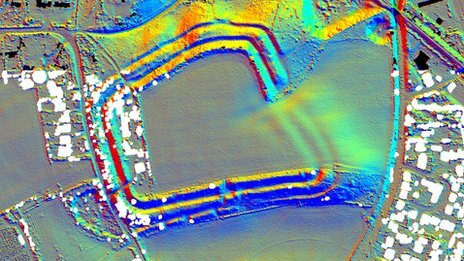 "It's a bit strange that we haven't found anything prior to Bronze Age on the Lidar, Mr Fisher says. But Mr Shaw explains: "We're sure Neolithic [Stone Age] people have been here, they just haven't left anything. "Some very early Palaeolithic tools have been found but the sites just don't feature on the Lidar." One explanation could be that Neolithic agriculturalists deforested and burned large areas and left little impression on the landscape. The New Forest was officially created by King William the Conqueror in 1079 for the pursuit of the "beasts of the chase". But as archaeologist are finding out, its history stretches back much further than that. These finds help paint a picture of how people lived in and used the New Forest for thousands of years.